There's still plenty of time for your child to enjoy tennis this summer! There are three Junior Tennis sessions left this year. Session 3 starts July 3! Remember, by popular request, we have an brand new Kid's Night for ages 6-10 on some summer Tuesdays. The schedule and more information is below. Perfect for working parents! Introducing the youngest to tennis! Smaller racquets and foam balls. They will be taught the fundamentals of the sport along with developing their overall hand-eye coordination. * Racquet provided if you do not have your own. This is a beginning class for students who have had no or little exposure to tennis. The class will teach beginning strokes, introducing forehand, backhand and volleys. Modified point play and games to promote the love of the game. This is for the child who has had some lessons and is an advanced beginner. Good for a beginner 10-12 year old or an advanced 8 and up child. The class will work on groundstrokes, volleys, serves and introduce point play. Perfect for working parents who want their kids to experience tennis! This is a drop in class. No sign up - come when you can! 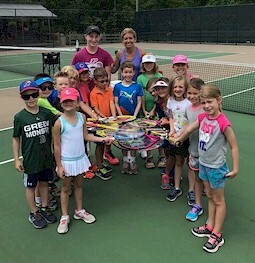 This class covers the basics of tennis. Learn groundstrokes, volleys and play games. To ensure everyone can get the proper attention from staff and so it is not too crowded, there is a limit of 30 students per class. Kid's Nights are current scheduled for the following dates. Please always check the pavilion board to be certain. This is for the intermediate to advanced middle and high school players. Strongly advise participants to take part in Junior Team Friday Tennis to get match play experience. To sign up for any adult or junior tennis program, you may register in person at the courts or fill out the form online. A parent must sign a waiver before their child is permitted to participate in any Junior tennis program. If you sign up in person, payment may be made at that time. Otherwise, payment is due on the first day of class. If you have questions, contact Carrie Smith at 614-264-9661 or email [email protected]. Read more about Junior tennis programs online.